Bigger than most countries. 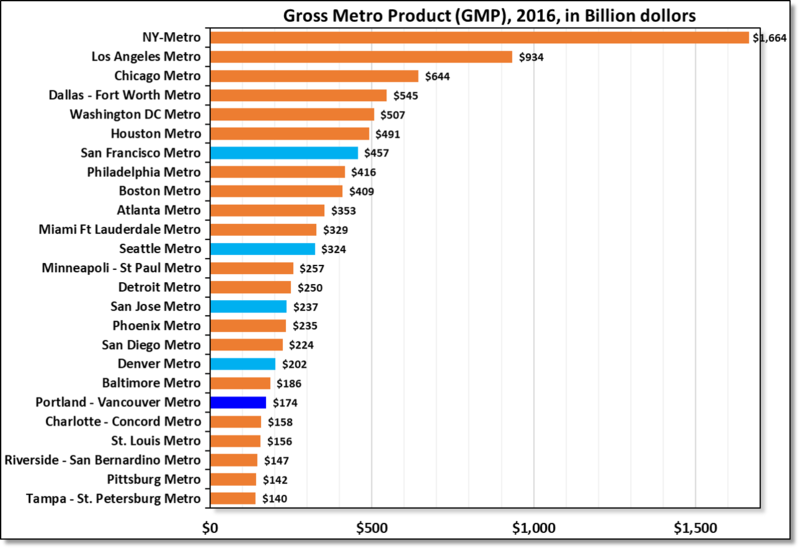 The Gross Metropolitan Product (GMP) of top 25 US metro regions, 2016. GMP is the market value of all final goods and services from the larger metropolitan regions & a definition similar to Gross Domestic Product for countries. At $1.66 trillion, the New York-New Jersey metro region has world’s 10th largest gross product, more than Canada (1.53tr), South Korea (1.41tr), and Russia (1.28tr). That’s about 9% of the US domestic product ($18.6tr). California has five metro regions in top 25, which explains why California state alone is the world’s 5th largest global economy (at $2.7tr), well ahead of UK ($2.63tr), France ($2.46tr), and India ($2.26tr). However, LA metro is more than twice the size of San Francisco, which one would expect to be growing faster due to recent high growth in housing & tech sectors. But the Silicon Valley tech services spread out beyond San Francisco & housing doesn’t contribute as much to the GMP as one would think. Some of this growth is also spread out into San Jose Metro. The fast growing Western metros are still far behind. The recent growth in Denver, Seattle & Portland has attracted lot of young workers but they have a lot of catching up to do with old behemoths like Philadelphia, Detroit and Baltimore.